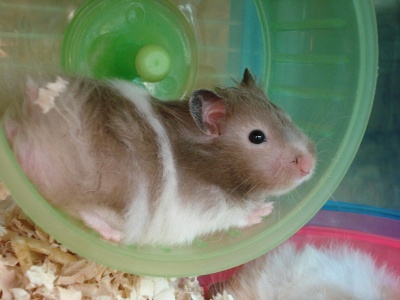 The Pet Wiki > Rodents > Gerbils > What Are the Differences Between Gerbils and Hamsters? February 20, 2012 July 8, 2018 Comments Off on What Are the Differences Between Gerbils and Hamsters? Gerbils have long, fur-covered tails that end in a small tuft. Hamsters have tiny stubs for tails, naked of fur. Gerbils tend to stand on their hind legs, while hamsters avoid standing as it takes much more effort for them. Hamsters are happy living a solitary life, but gerbils are social creatures and will be lonely without another gerbil. In both cases, two females are likely to be aggressive with each other, so two males is a better bet. Hamsters are nocturnal and will spend most of the day sleeping. Gerbils are diurnal and are more willing to play during the day. Gerbils are more energetic and active than hamsters. Gerbils have a higher risk of overheating. In a house without air conditioning, a temperature-controlled cage is recommended. Hamsters are more prone to biting, especially when their sleep is disturbed or when they are startled. Gerbils should not live in plastic houses since they can chew their way out of them. Hamsters can be placed in a plastic cage. Wire cages are also not appropriate for gerbils; they have been known to break their legs on the wires. Gerbils should be housed in aquariums with a wire-mesh lid. Hamsters should not live in aquariums, because hamsters need more ventilation. Hamster cages must be cleaned more often since they produce more waste than gerbils. Hamsters and gerbils have very similar diets. However gerbils can survive on an entirely vegetarian diet whereas hamsters prefer to consume protein too. Keeping hamsters as pets is generally legal; some places prohibit the keeping of gerbils.